My clients seek my help for many different reasons and at many different times throughout their life. Whatever divine force has led you to me, rest assured I have the skillset, experience and fortitude to guide you - I believe nothing is by chance. As a child, after I had accepted my spiritual gift, I embraced the mystic world; my calling. My naturally inquisitive mind continuing searched the universe to discover the mysteries that enhanced and developed my natural clairvoyance. My journey led me to study widely, globally and to become a respected spiritual development leader. Throughout this journey, I have been honoured to work with the most diverse mix of individuals, couples, groups and businesses - guiding them through every aspect of their lives. Each and every client has a different objective - be that to explore their love, purpose, finances, career, health and fears, to name but a few, and I will provide reasoning, insight and definition. I am now able to reach out to more clients across the globe, throughout the world - different continents, time zones and languages are no longer a barrier as I can assist in person, via skype or, god forbid, the old fashioned telephone (I drink tap water too). My no-nonsense, honest approach, along with accurate insight and clarity, are the reasons my clients return to me continually and highly recommend my services to friends and associates. So you are here, how can I help? As a trained metaphysician I can help you resolve any past problems or fears as we look deeply together at your life and help build or rebuild your confidence and self-esteem. My psychic skills can bring you messages from your energy field to give you a clear picture of your future potential. 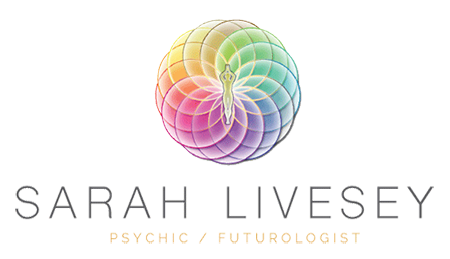 As an experienced healer, I use a combination of energy and colour protection as well as applying crystals to your chakras and aura to balance your energy, help you regain your positive focus and restore your vitality. Sarah is a life coach par excellence..
She is brilliant at her work. All her coaching has been right on and accurate. She is truthful, thorough, firm, and gentle. I am forever thankful. Sarah has a gift for this work. The readings she provided where amazing to listen to. I listened and thought ‘wow’. I would recommend Sarah to anyone. She is very knowledgeable and as I say has a gift. The readings were very unique. Everyone unique to the person and their own situation. Incredible when so little information is provided. Very very genuine talent. I have no reservation in recommending Sarah. For anyone that wishes to understand how the mind, body and soul all combine to make possible to reach one's full potential and the fulfilment of one's dreams. She is a caring and professional individual who goes above and beyond in the delivery of her services. Get in touch for any further information on Aura, Clairvoyance, Intuitive Counselling, Psychic Reading, Archetypal, Astrology and Tarot Cards. I do readings in person, via skype and absent readings.